Railpictures.ca - John Pittman Photo: Running long hood forward as built and remanufactured, GP9rm CN 7029 of CN switcher class GS-418b leads other-way-around road-switcher sibling CN 4118 and GP38-2w CN 4771. Train 556 has just entered the Oakville Sub from Aldershot yard, heading eastward to Oakville Yard with all multilevel autoracks – presumably empties to be loaded with new vehicles from the Ford Oakville Assembly Complex. | Railpictures.ca – Canadian Railway Photography – photographie ferroviaire Canadienne. 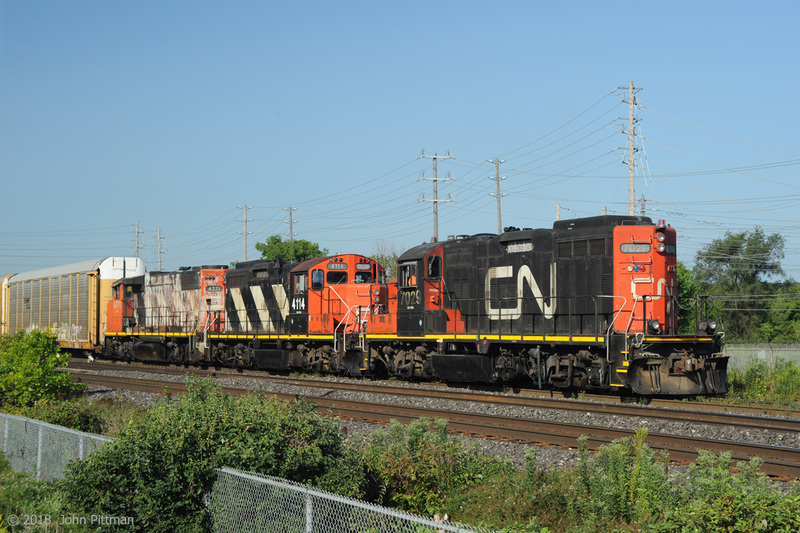 Caption: Running long hood forward as built and remanufactured, GP9rm CN 7029 of CN switcher class GS-418b leads other-way-around road-switcher sibling CN 4118 and GP38-2w CN 4771. Train 556 has just entered the Oakville Sub from Aldershot yard, heading eastward to Oakville Yard with all multilevel autoracks - presumably empties to be loaded with new vehicles from the Ford Oakville Assembly Complex.